When Hurricane Florence came ashore near Wilmington, North Carolina in mid-September 2018, the local housing stock suffered significant damage. Those displaced have struggled to find alternate housing, as the area’s apartment stock is limited to just 22,000 apartments – just 1,100 or so of them vacant prior to the hurricane. The occupancy rate has jumped from about 95% to roughly 97% in recent months. Even more striking is the acceleration of rent growth. 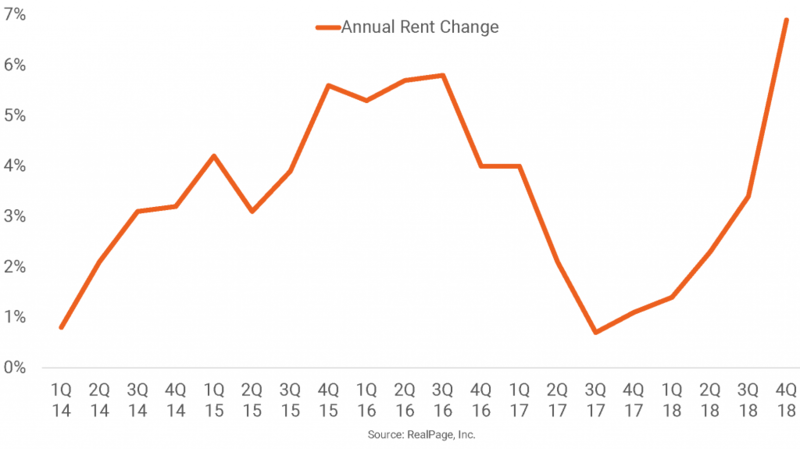 After annual rent growth had averaged about 3% during the previous five years, calendar 2018’s pricing upturn came in at 6.9%. Wilmington will be an interesting market to watch in 2019. Texas and Florida metros that experienced hurricane damage in 2017 tended to register tightened apartment markets during early 2018, but then sometimes returned to pre-hurricane performance levels in the final months of the year.